I’m very excited to be starting off this spring with a new set of wheels! I looked online for something used, but I couldn’t quite find what I wanted. And in the end, Canadian Tire had exactly what I was looking for within a very reasonable price range: a multiple-speed cruiser-style bike that let’s me sit upright without leaning over the handles. I’ve been through the gamut with bikes over the years. 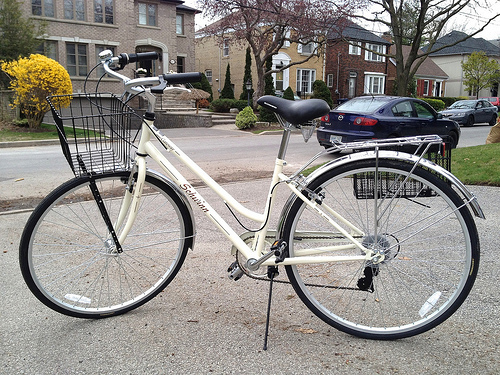 I had a bike stolen about once annually for the first five years I lived in Toronto (i.e. five bikes stolen!) — from inside my apartment buildings, from outside where I worked, from outside of school — it was impossible to keep one safe for very long. My insurance company finally said, “we just can’t keep doing this.” They were kind to me for a long time, so I couldn’t really complain. Locals will remember the big bust of Igor Kenk, now known as Canada’s most prolific bike thief — I suspect most if not all of my former rides were scooped and sold via his shady operation, fronted by a bike repair shop on Queen Street West. Apparently he would pay other thieves good cash for questionably obtained bikes, and when police finally took action against him they raided several garages and warehouses, recovering about 3000 bikes, 450 of which were reclaimed by their original owners, some of them having been without their rides for a decade or two! Sadly, by the time he was finally busted, I had long ago shredded the paperwork of those old bikes and had nothing that I could use to prove that one of them might have been mine. After bike #5 was taken, I dispensed with replacing my stolen bikes with new ones. Instead, I bought a former coworker’s bike for $50, and it’s been my ride ever since. It’s an old Raleigh mountain bike, and it has served me very well. For many years I biked to work with it. But it has never been a pleasure to ride. I hate how it makes me lean out over the handlebars and how I absorb every bump through my arms. I had added some baskets to it to make it easier to use it for errands such as small grocery runs, but the baskets made it awkwardly balanced and it would often fall over while on its kickstand, and be even more challenging to balance while riding. If you took your hands off the handlebars while stopped, the wheel would spin out to one side. A couple years ago I put a cruiser saddle on it, and while that helped a bit with comfort, the fundamental problems remained — I just don’t enjoy riding it. But this baby, my new Schwinn, is a lady’s step-through cruiser hybrid (meaning it has multiple speeds for dealing with the odd slope). I put my baskets on it from the Raleigh and it’s perfect! No balance issues here. I took it for a couple of spins to get the seat adjusted to the right height, and it’s so comfortable! No more shock absorption through the arms! Cracks and bumps in the pavement are no big deal anymore. No more unintentional cleavage reveals from leaning too far out with a scoop-necked T-shirt! AWESOME! I no longer live within reasonable bike distance to work, but I will probably start biking to the subway again which means I can easily take care of a few quick errands on the way home, like grabbing a few groceries here and there, without feeling like I need to take the car. Need something quick from the drugstore? Go for a bike ride! Need to go to the bank? Hop on my two-wheeler! I might even see if we can teach Luna to tag along. Perhaps that’s a little overly ambitious… we shall see! I also hope to get us a bike rack for the car so I can start taking the bike up to the cottage. I get bored sitting around all the time, and I often think it would be a nice place to go for a ride. Chris is even thinking he might give my old bike a try (he has two of his own bikes in the garage that are very broken down and need a lot of TLC, but he used to be an avid bike commuter until he had a few “door prize” accidents, one very serious). It would be awesome if we can start going for rides together. We won’t commute all the way to work (there are some killer hills on the home-bound route that I’m not willing to negotiate after a long day at the office), but we would likely start biking to the subway together, and hopefully we could start going for weekend rides down at the beach or in the Don Valley. Having a bike rack for the car would also mean we could try to get out of the city now and then for some day trips. I’m very excited about the possibilities! But before I get too ambitious, I need to de-pretty it a bit. No need to invite any would-be thieves. It’s a shame to take away the shine, but it’s a necessary evil. I’ve heard that bike thefts have dropped significantly in this city ever since Kenk was arrested, but I’m sure there are other enterprising jerks out there all the same. My new wheels are just a bit too shiny right now to leave safely anywhere for any length of time. It was not terribly expensive — it’s just a basic steel frame, no fancy aluminum or anything — but it’s a style of bike that I suspect is fairly desirable. I never had to worry with the Raleigh, it was chipped, grimy, a bit rusted here and there, and well-worn in. I’ll have to put my artistic skills to work to camouflage it. Hi, just wondering if you found the bike online…this is exactly what I am looking for but I can’t find it online. Wondering if it might be specific for your city? Maybe you could give me some info as to price, exact name etc…maybe I can track one down. This is the Gateway model, by Schwinn. I found it at the Canadian Tire store up on Shepphard Avenue in Toronto; but curiously this model doesn’t seem to be listed on the Canadian Tire website. I don’t know why that is, but the Schwinn Memento is about the same price and very similar features and the bike is listed on the Canadian tire site. Good luck in your search!